It is difficult to choose the most fantastic space-related photograph of the year. There are, after all, many contenders. We had, for example, many “first-time” pictures of features on the Red Planet, our neighbor Mars. This one shows the west rim of huge Endeavor crater, which has a diameter of about 14 miles. The crater is characterized by geological features that are older than any others Opportunity has investigated during its mission. 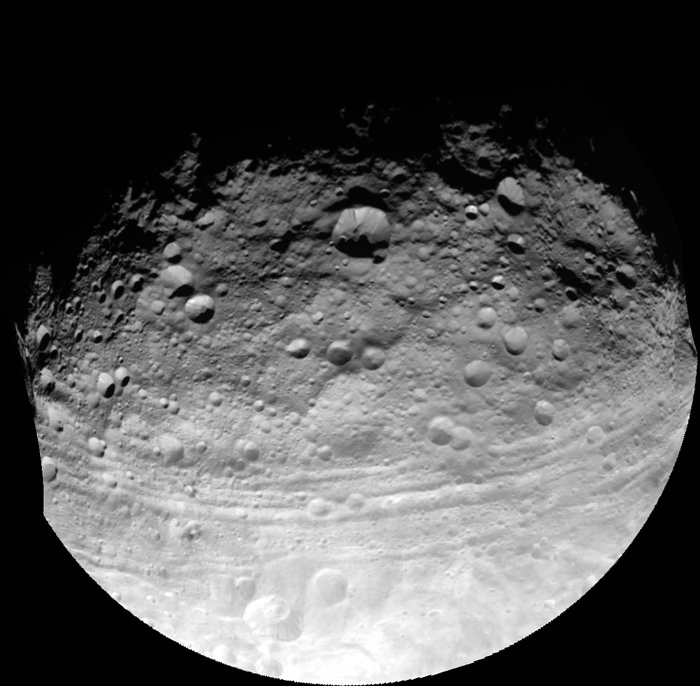 Then there was the first image ever obtained of the huge asteroid known as Vesta. 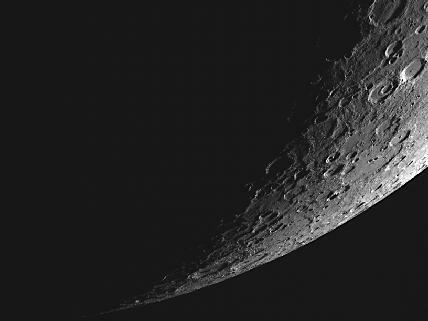 NASA’s Dawn mission is in the midst of an exploration of the asteroid belt. This full view of Vesta was taken from a distance of 5,200 kilometers. The asteroid has a mean diameter of about 530 kilometers and is the second-largest object in the asteroid belt, second in size only to the dwarf planet Ceres. But my favorite picture from 2011 is this one, which was obtained by NASA’s Cassini probe. It shows a storm encircling the huge planet. The storm is the most intense, and the largest, ever observed by Cassini. It produces a significant amount of radio noise, which indicates that there is lightning occurring in Saturn’s atmosphere. 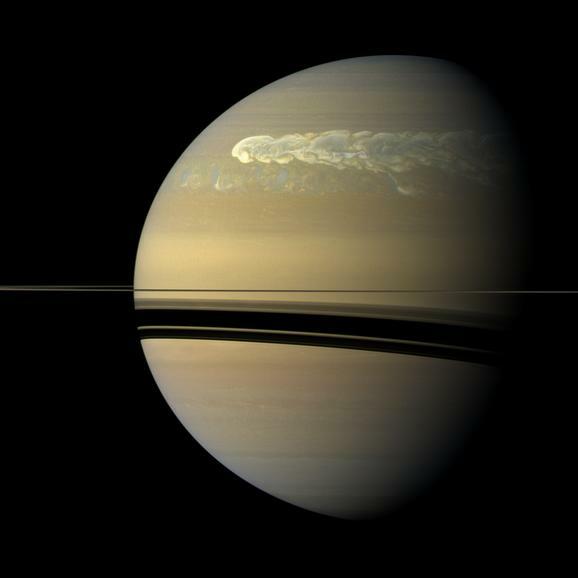 One odd feature of storms on Saturn is that they occur when a huge amount of energy is released all at once, which is unlike the meteorological pattern on other planets. Check out this photo showing the collapse of an iceberg in the Southern Ocean earlier this month. The iceberg broke off from a larger ice floe about twelve years ago. Called B-15J, the iceberg was a remnant of the much larger iceberg B-15, which broke off from Antarctica’s Ross ice sheet in 2000. Before breaking into smaller pieces B-15 was about 170 miles long and about 25 miles long. Icebergs result from the calving of ice shelves, which are the edges of glaciers. When the ice shelves break up, a phenomenon that can happen with greater frequency as Earth’s atmosphere warms, the glacier itself is likely to begin to move faster. When they do, more ice enters the oceans, which can cause increases in sea levels. Icebergs melt as they move into warmer waters farther away from the poles. 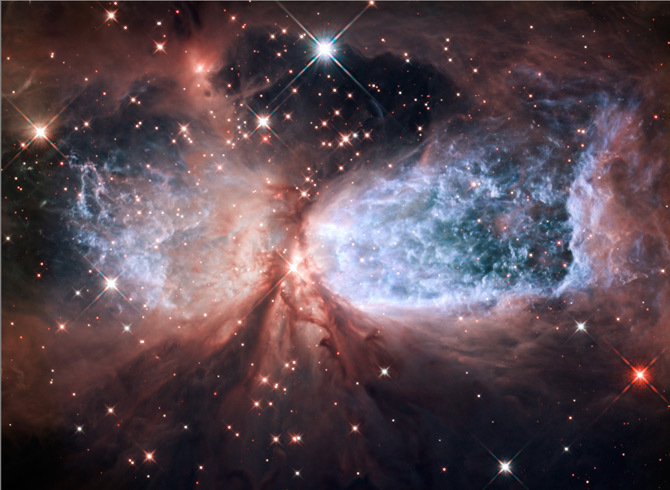 Photo courtesy NASA. Hat tip to the folks at Our Amazing Planet for the heads up! Two planets outside of our solar system that are approximately the size of Earth have been discovered by researchers using the Kepler space telescope, NASA announced last week. The exoplanets are too close to their star to allow liquid water to exist on their surfaces and are therefore unlikely to be habitable. “This discovery demonstrates for the first time that Earth-size planets exist around other stars, and that we are able to detect them,” Francois Fressin, a researcher at the Harvard-Smithsonian Center for Astrophysics and the lead author of the study that documents Kepler’s new discovery, said. The two exoplanets are the smallest found by the Kepler space telescope thus far. They are about 950 light years from Earth and are part of a solar system called Kepler-20, which is located in the constellation Lyra. Kepler 20e, the second planet in the system, is about 87 percent as big as Earth, with a diameter of 6,900 miles. It has a period of revolution of 6.1 days and the temperature on its surface is about 1,400 degrees Fahrenheit. Kepler 20f, the fourth planet in the compact system, is slightly larger than Earth, with a radius three percent larger than Earth’s. Its diameter is 8,200 miles. The average surface temperature on Kepler 20f is about 800 degrees Fahrenheit, which is slightly cooler than the surface temperatures on Mercury and Venus. Kepler 20f’s year lasts 19.6 days. Three other planets also populate the Kepler-20 system. All five of the planets orbit the star at a distance that is less than that of Mercury to our Sun. The planet farthest from Kepler-20, Kepler 20d, completes a revolution of the star in less than 80 days. The Kepler-20 system is unusual in another way as well. Its planets alternate in size from relatively large to relatively small. In our solar system the smaller planets are closer to the Sun, with the outer planets significantly larger in size. Scientists use a planet’s transit of a star, which is observed in the form of diminished brightness in the star’s light, to search for exoplanets. If a transit of a distant star is detected, scientists proceed to calculate the exoplanet candidate’s orbital size from the time it takes for the transit to be repeated and the mass of the star it orbits. Scientists then determine the size of the exoplanet by measuring the decline in the star’s brightness and the size of the star. They can then calculate the exoplanet’s average surface temperature from the orbital size and the temperature of the star. If a transit is seen at least three times then scientists use Earth-based telescopes and the Spitzer Space Telescope to verify possible exoplanet candidates. Kepler will observe more than 150,000 stars during its three and one-half year-long mission. Boulder-based Ball Aerospace and Technologies Corp. supports mission operations for the Kepler space telescope along with the University of Colorado at Boulder’s Laboratory for Atmospheric and Space Physics. The study documenting the discovery of Kepler 20e and Kepler 20f appears in the Dec. 20 edition of Nature. For night sky enthusiasts, 2012 promises to start with a shower. A meteor shower, that is. The Quadrantids meteor shower will peak on Tuesday night. The peak is short, with viewers able to see as many as 130 meteors flashing across the sky. A lesser number, perhaps as many as 50 in an hour, may be seen until sometime shortly before dawn on Wednesday morning. Viewers should look for a place far from city lights to observe the phenomenon, which appears to the eye to originate in the constellation Bootes. In fact, the Quadrantids come from an asteroid called 2003 EH1, which scientists think is part of a comet that broke apart in the late fifteenth century. The meteor shower gets its name from a defunct constellation called Quadrans Muralis, which used to show up on star maps between Bootes, Draco, Hercules, and Ursa Major. Quadrans Muralis ceased to be a recognized constellation in 1922, when the International Astronomical Union adopted the modern list of 88 constellations. The Quadrantids are not visible in the southern hemisphere, and the weather during the northern winter can make it difficult for viewers to see them. For this reason NASA’s Ames Research Center conducted an airborne mission to observe the shower in January 2008. Scientists flew from San Jose, California over the North Pole and back in a Gulfstream jet to determine when the Quadrantids peak and how the meteors disperse. The best view of the meteor shower will be to the north – northeast part of the sky.